.The October 24, 2012 poll geared to likely North Carolina voters showed an 8-percentage-point lead by Governor Romney over President Barack Obama, 53 to 45 percent. The margin of error is +/-2.4 percent. North Carolina has 15 electoral votes in play. Male voters are the reason the North Carolina vote survey went to Governor Romney. 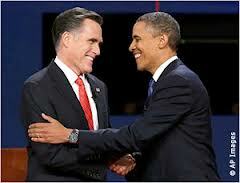 With male voters, Governor Romney leads President Obama by 17 percent, 57 to 40 percent. Females voters are split in half; 49 percent for each candidate. Fifty-two percent of North Carolina voters, survey results showed, are dissatisfied with President Obama’s past four years in office. Only 43 percent are satisfied with the President’s performance in the White House. Fifty-one percent of North Carolina voters believe the country, under the Obama Administration, is headed in the wrong direction. Only 42 percent agree with the direction the country is going. President Obama, the first Democrat to win in the Tar Heel state since 1976, won in 2008 by a small margin: 14,000 votes out of the 4.3 million cast. The Democratic convention was held in Charlotte, partly to help ensure a 2012 victory, similar to the victory President Obama won in Colorado when the Democratic convention was held there in 2008. North Carolina has 6,601,534 registered voters, and the projected voter turnout in that state is expected to be 64 percent. In a recent swing state tour, Obama skipped North Carolina. Democratic National Committee Chair Debbie Wasserman Schultz said on CNN that the campaign is still committed to North Carolina. Of the four most recent presidential election polls, two show a Romney lead, one shows an Obama lead and one shows a tie. When the margin of error in the polls is considered, Romney still wins in two polls, but the other two could swing differently. We believe at this time Governor Romney has the advantage in North Carolina. North Carolina is a must win state for Governor Romney. We have been saying for weeks, that President's Obama advantage lies in the electoral college and his multiple paths to victory.